In part one, I wrote about the features of the best backpacking foods (calorie dense, easy to prepare, nutritious, non-perishable, appetizing, inexpensive, and versatile). In part two, I list common items on my resupply shopping list that take all of that into account with more nutrition advice from New Orleans Saints sports dietitian, Tavis Piattoly. This series on food is about long distance hiking with the aspiring first-time thru-hiker in mind, but it will still be relevant for any multi-day hike. The main difference is that with long distance hiking, things like budgets, resupplying along the way, limited availability of items in towns, maintaining body weight, and good nutrition are more important factors to consider. Before making your shopping list, here are a few things to consider. There's an infinite number of ways to make an alcohol stove, but I like this one because it doesn't need to be primed, it can't explode like pressurized stoves, the burning fuel can't spill if tipped over, and it weighs just 15 grams. Here's how to make it. Rather than spend money on various water containers, I carry one or two 16 oz soda bottles and one 2 L bottle for camp. I always carry more than one bottle, so I can lose or break one and still have a way to transport water. A hiker with a dog came to my shelter on the Long Trail in Vermont, and the dog decided one of my water bottles was a fun chew toy. I'm glad I had a backup. At under one ounce, soda bottles are lighter than Nalgene and aluminum bottles. I'm not a fan of water pouches, because they're harder to fill with water from a slow moving source or lake. The rigidity of a plastic bottle won't collapse under the weight of the water. 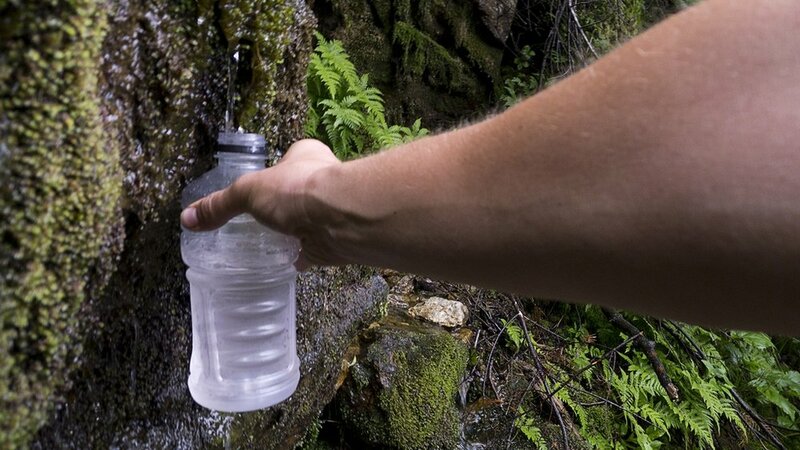 Unlike Nalgene and other hard plastic or aluminum bottles, soda bottles can be used with squeeze filters, such as Sawyer or LifeStraw. This makes it quick and easy to fill my cook pot or to squeeze all the air out to treat the cap and threads when chemically treating the water. Also, poke a few holes in a spare cap, and you have a camp shower. Hydration bladders are difficult to get in and out of my backpack, hard to see how much water you have left, hard to clean, and not easy to attach to the outside of any of my packs. Another reason I've heard for not reusing plastic soda bottles, is that bacteria can develop under the cap, but these get cleaned regularly during my bleach treatment, so I'm not concerned about that. Anyway, It's just as much a problem with Nalgene bottles, Aluminum Bottles, or hydration bladders. Q&A: How Much Water Should I Carry? The amount of water you should carry depends heavily on outdoor temperatures and varies from person to person, but the rule of thumb is: drink 1/2 to 1 quart of water per hour of hiking. On a hot day climbing up a mountain, your body can lose 1 - 2 quarts per hour from perspiration. It's pretty simple though, if you feel thirsty at all, drink. If you want to take it one step futher, you can determine how much water you are losing during exercise. Weigh yourself before and after a hike or workout. Subtract about 7% from the difference in pounds (to account for the burned calories), then multiply by 16. That's more or less how many ounces of water you need to replace. If you are smart about choosing your water source, you could go for days, weeks, or even years without treating your water and never get sick. It's a gamble, but after spending a few days stepping over moose poop, or seeing a bloated dead animal floating in a water source, or worse yet, having to witness your friend doubled over with stomach pains and running off into the trees to decorate the foliage... anyway, what I'm trying to say is, here's how I treat my water.